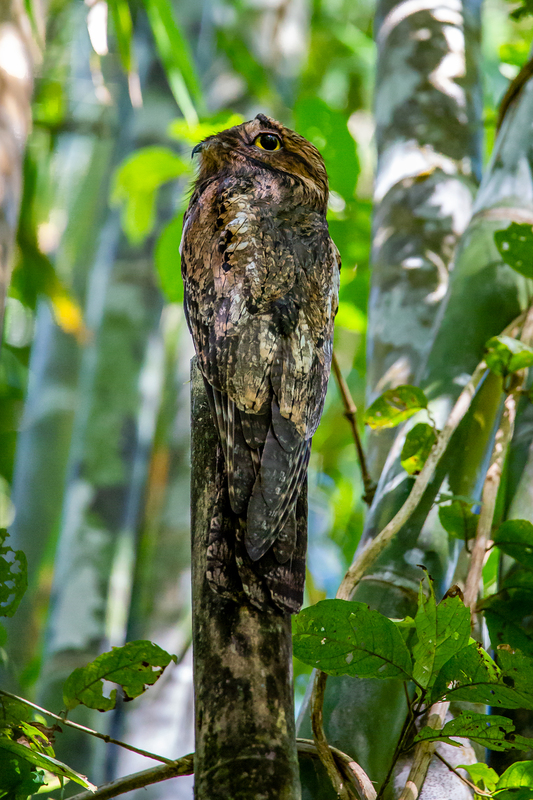 Day one of the Backcountry Journey’s Wildlife of Costa Rica photography tour begins in the town of Alajuela, a suburb of San Jose, home to one of the country’s two international airports, Juan Santamaria International Airport. Arriving in a new country for the first time is always exciting but can sometimes be nerve-wracking as well. Fortunately though, going through customs in Costa Rica’s Juan Santamaria Airport is as painless as any customs process I’ve experienced. Arriving travelers move quickly through customs and baggage claim to find a fleet of little red taxis waiting to take them wherever they desire. Drivers of these cabs would happily take you all the way to Panama if you were willing to pay the fare. But, for BCJ clients, they only need to make their way to the Alajuela Marriott Inn, which is just a few blocks from the airport on the free hotel shuttle. Once our guests settled and checked in, we sat down to a nice dinner and orientation meeting at the hotel restaurant, which is quite nice. Our trip orientations are designed to give our guests a chance to get to know the guides and the guides to get to know the guests, as well. We like to hear about folks’ photographic experience, goals for the specific trip, and what it was that made them choose the trip. Here we learned that this was going to be everyone’s first time in Costa Rica! An early bedtime followed the orientation dinner as the following day promised an early domestic flight to the country’s far southwest and the majestic and wild Osa Peninsula! After an early breakfast at the hotel we loaded into the hotel shuttle to head to the airport, this time to the smaller domestic terminal. We moved through the rudimentary security checkpoint to board our single engine Cessna 208 to fly into Puerto Jimenez, a gateway town to Corcovado National Park. Flying in these planes always proves to be exhilarating! After takeoff the plane soars up to 9,000 feet and heads west to the coast before turning south, with stunning views of the San Jose Valley and the rugged Pacific coast along the way. The flight from San Jose to Puerto Jimenez takes about 45 minutes. Upon touching down at the small airstrip, we were picked up by our driver who would be taking us to the small beach town of Carate. Carate is the town at the end of the road (about 35 miles from Puerto Jimenez), and travelers wishing to head into Corcovado National Park from here must walk the final couple of miles to arrive at the entrance. Carate is also the location of the Lookout Inn Lodge, the incredible tree-house styled lodge where we would be staying for the duration of the trip. The drive from Puerto Jimenez to Carate takes about an hour and a half. The road can be quite rough at times, but any discomfort is made up by the beautiful nature passing by out of the window. We move through primary and secondary rainforest and alongside pristine black sand beaches. Our driver was even kind enough to make a stop along the way to show us two screech owlets nestled in a tree along the roadside! We arrived at Lookout Inn just before lunch time and were immediately greeted by a troop of at least 20 squirrel monkeys running around the railings and decks of the lodge. Lookout Inn Lodge sits atop a hillside overlooking Carate Beach, a seemingly endless stretch of black sand and surf with not a structure in sight. The lodge has three decks for viewing and photographing wildlife, and the monkeys make excellent use of the wood railing and columns as they jump from tree to railing and back again. Everyone was assigned their rooms, which are open-air tree-house style rooms that all have breathtaking views, and then rejoined on the main deck of the lodge for lunch. Lookout Inn Lodge’s chef and kitchen staff are absolutely incredible. Paulo, the head chef, is a trained practitioner of the culinary arts and is also a singer and guitar player, which earned him the nickname the Singing Chef. Every meal was just impeccably prepared! As lunch came to an end, we took an hour and a half to hang at the lodge and capture images of any lingering squirrel monkeys, as we waited for the midday sun lower a bit as it made its way across the sky. As the light softened with the sun’s westward march we geared up for our first hike down Shady Lane. Shady Lane is a dirt road that travels back into the jungle from the main road, crossing two creeks. This part of the road is ideal for spotting mantled howler monkeys, spider monkeys, tayra, coati, and birds of prey. Before embarking, we went over everyone’s camera settings, getting everyone ready to capture some fast action as animals moved through the jungle and amongst the treetops. The hike is completely flat, and the entire loop is about three miles. 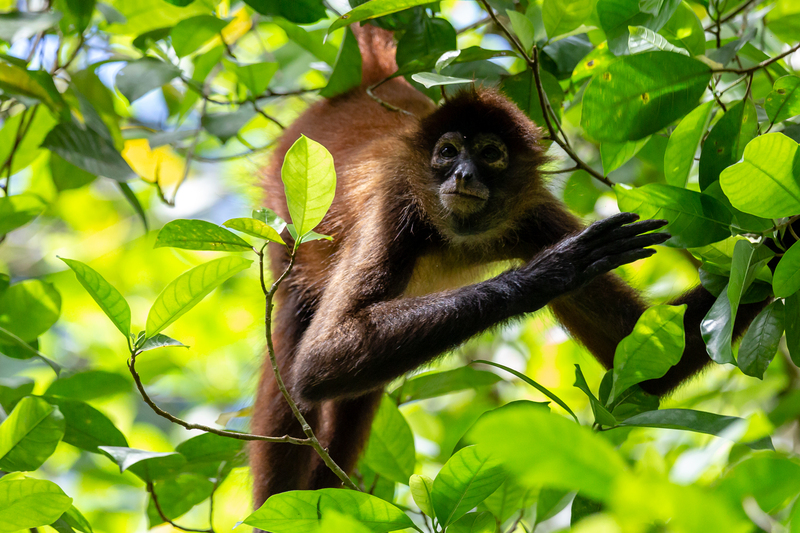 Having already encountered squirrel monkeys and white-faced capuchin monkeys at the lodge, it wasn’t long before we’d found our first spider and howler monkeys, completing the list of all four species of primate in the first day! We also encountered a roadside hawk, a white ibis, and the iridescent flashing of a blue morpho butterfly flying gracefully down the dirt path. As we made our way back to the lodge, I noticed that there was a squall moving in quickly from the sea. We packed our gear into our bags and quickened our pace to reach the lodge before the wall of rain caught us. By the time we were climbing the Lookout Inn stairs, the rain was falling and increasing in intensity. We made it to shelter just in time, as the squall hit with intensity but brevity, and within moments had blown itself out. Before doing so though, it dropped nearly three inches, of rain according to the lodge’s rain gauge. Such is life in a rainforest. As the sun dipped into the Pacific Ocean and night consumed the jungle, we were warm and comfortable enjoying cold beers on Lookout’s deck. Dinner was served, and we dined in the open-air dining room atop the lodge. After going over the following day’s plans we retired to our rooms for some rest. Tomorrow we were heading into Corcovado National Park! The day begins early in the jungle. By the time the sun rose at 5:40, we were already positioned on the observation decks, cameras in hands. In an environment that gets as warm as it does on the Osa, people and animals alike rise early to forage and work in the cooler morning hours. By midday, the heat can be intense, and all critters seek shelter and siesta to wait until the evening’s reprieve. So, for the wildlife photographer, it is imperative to be up and shooting when the animals are active. And dawn at Lookout Inn provides incredible views and proximity to a wide array of wildlife. 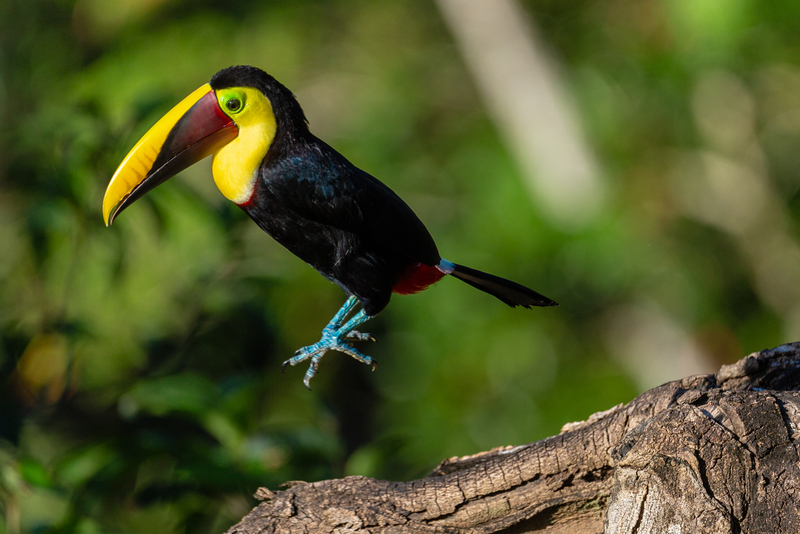 We were to spend every dawn there on the decks, and every morning we were able to photograph toucans, scarlet macaws, tanagers, squirrel monkeys, capuchins, hummingbirds, and even coati! This morning though, we would not be able to shoot there long. Breakfast (a huge spread) was served early, and by 7 am our local guide, Luis Daniel, had arrived to take us into Corcovado National Park. Corcovado is a truly enormous area of absolute wilderness. And though access to the park for guests is limited to only about 1% of the park’s total area, access to this 1% is highly controlled. Anyone wishing to see the park must employ a licensed local guide, and Luis is always our man! He is an expert on all things wildlife on the Osa, and his guiding and interpretation would prove to be interesting, thoughtful and engaging. As mentioned before, no roads access Corcovado National Park so our walk began two miles from the Park entrance at the Rio Carate. From here the trail moves parallel to the beach through pristine primary rainforest. This section of trail has two names I know of; Beach Trail and Monkey Trail. And, it wasn’t long before we were encountering monkeys. 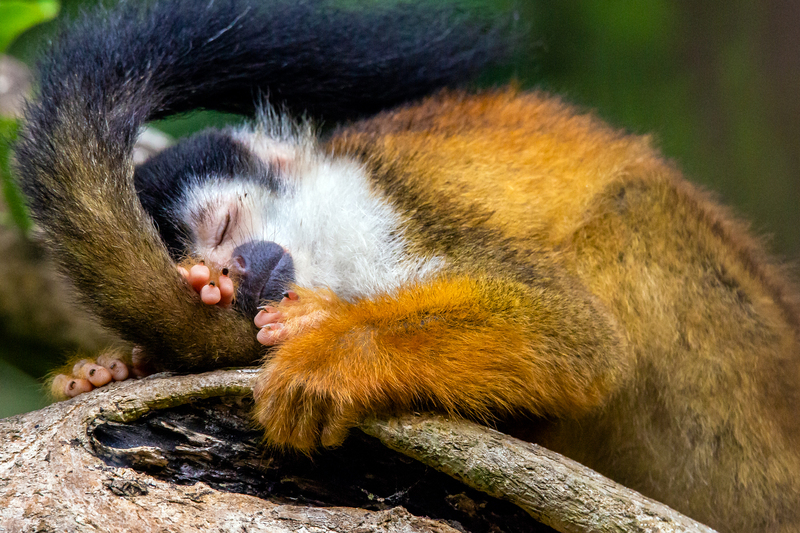 Capuchins, which are the smartest of Costa Rica’s primates, are regularly hanging out along the trail as they scavenge for ripe bananas and plantains while using twigs as skewers to carve insects from trunks of trees. Enormous ficus trees line the trail with their buttress roots streaming out in all directions in a pattern reminiscent of folds of fabric. Banana trees are also all over this section of trail, which is a favorite home for one of Costa Rica’s smallest mammals, the tent-making bat. These bats cling to the underside of a banana leaf and then use their powerful little jaws to bite a seam into the leaf, forcing it to fold over, creating a little tent for the bats to roost in. Along the trail we encountered toucans and macaws, leaf-cutting ants, trogans, and more tanagers, all very nice photographic subjects. We hiked along the beach trail to La Leona Lodge, a remote jungle lodge, at which point the trail took us onto the beach for the last half mile or so to the park entrance. At this side of the park, the entrance is monitored by the La Leona Ranger Station. Here, park visitors can use the restrooms and refill water bottles before continuing into the park itself. Once entering the park, the trail moves through thick jungle canopy just adjacent to the beach. Coatis are a common sighting along this section as well as tamandua, however on this particular day they remained out of sight. After lunch and good rest, we packed up, turned around, and began the walk back to Rio Carate. The weather remained clear for the whole day, which we took advantage of in a macro setting, photographing the leaf cutter ants moving up and down tree trunks hauling their loads of clipped leaves. We arrived back at Lookout Inn by 4 pm, had some cold drinks, and cooled our tired feet in one of the lodge’s many plunge pools. We spent the rest of the afternoon light shooting macaws from the lodge’s platforms and then headed upstairs for another gourmet dinner prepared by Paulo and staff. On this night we would be graced by the talents of our “Singing Chef” as we dined. After dinner, we retired to our cabanas to rest in anticipation of another full day. For our fourth day in Costa Rica’s Osa Peninsula we would be hiking to a waterfall on a private research base, which we’d been granted permission to access by the property’s caretaker. First, though, we met on the Lookout viewing platforms -as per the norm- at 5:30 that morning to photograph the dawn parade of birds and monkeys moving around the lodge. Again, we were presented with excellent shots of toucans, macaws, and two species of monkey; the squirrel monkey and the white face capuchin. Soon, the sun was climbing up past the eastward horizon, and a luscious breakfast spread was being laid out for us, including fresh tropical fruit, gallo pinto (a traditional breakfast dish consisting of rice fried with beans), scrambled eggs, sausages, pancakes, and toast. After breakfast, we geared up for our adventure to the waterfall. This waterfall is up a short trail that follows a stream into some primary forest. The road leading to the trail is a beautiful one, shaded by a cultivated tunnel of hibiscus bushes. As we moved along the jungle trail we began seeing signs of the recently ended rains that drenched the Osa during October and November, including downed trees and some major erosion. We pushed forward only to find that about 100 meters short of the waterfall a massive landslide had come down completely blocked our trail! It was disappointing for sure, but also interesting to see how landslides are a normal part of the jungle landscape during the rainy season as they are constantly changing the topography from year to year. We took a moment to take in the incredible sight of tons of rock, earth, and fallen trees clogging the gulley, and then turned and made our way back to the research station. Here, we stopped to work on our macro photography again, finding anoles (lizards), and stick bugs moving about in the midday sunshine. Filtered sun through the canopy above created beautiful abstract compositions of tropical flowers, dragon flies, and baby pineapples -planted by the property’s caretaker. Back to the lodge for lunch and of course more photography of tropical birds from the platforms. Our walk to the lagoon awaited the early evening, so we took some time to rest in preparation. Carate Beach’s lagoon is a brackish body of water that only connects to the Pacific during the highest tides. During low tide, the lagoon is separated from the sea by a thin stretch of beach. The lagoon is a beautiful body of water, ringed by tall grasses and coconut palms and black sand. It is home to a wide array of marine and tropical birds, including tiger herons, great white egrets, magnificent frigate birds, parrots, and macaws. Giant basilisk lizards live in the grasses at waters edge, and crocodiles and spectacled caiman cruise the calm water in search of prey. We made it to the lagoon just in time for the sun’s light to warm and soften as dusk approached. We had over an hour of perfect light, and had opportunities to photograph a great white egret, little blue herons, a green heron, and a northern jacana. As I made my way around the edge of the lagoon, looking for birds, a large crocodile slipped into the water 50 yards in front of me. I beckoned the group over, and we were able to capture some images of the large crocodile’s graceful movement through the calm water. As the sun began to dip into the Pacific, we turned our cameras and switched to our wide-angle lenses to shoot an epic sunset. Carate Beach’s converging lines of surf and tree line made for a beautiful frame along the glistening sea, reflecting all the colors of orange, pink, and red in the sky above. Our fifth day on the Osa Peninsula began like the three days prior, up before dawn and shooting birds and monkeys from Lookout Inn Lodge’s decks. Today though, after another delicious breakfast, we were being picked up again by local guide Luis Daniel for a driving wildlife safari in his ruggedly equipped Landcruiser. He arrived at 7 am, and we loaded up to begin our drive down the remote jungle road that connects Carate to Puerto Jimenez in search of wildlife. 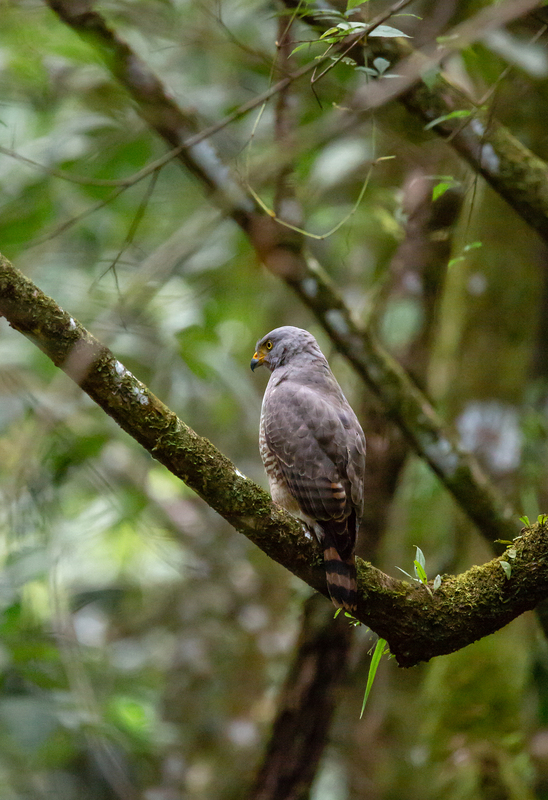 After driving only about a mile from the lodge we encountered a roadside hawk perched on a limb extending out over the dirt road. Upon disembarking from the vehicle, we discovered a troop of spider monkeys in a neighboring tree and an entire colony of army ants on the hunt. Army ants really are like the bullies of the jungle, they head out en masse -one million individuals strong- in search of anything that moves. When they find something they want, they’ll attack with ferocity, killing and devouring giant grasshoppers, cicadas, lizards, tarantulas, and anything else small enough to take down. Flocks of birds follow the ant colony’s march through the forest, snatching up insects fleeing from the ant horde. As our “safari” continued we encountering toucans, a black hawk, and several king vultures. We stopped to check out a 700-year-old strangler fig, massive and gnarled. The strangler fig’s name in Spanish is matapalo, meaning tree killer. It propagates by taking over other trees, shooting vines out and around the host tree, eventually strangling and killing it. After 700 years this massive strangler fig had completely destroyed the host tree, leaving only a hollow void in the middle of the fig tree where it once stood. Sure enough, there was a tamandua sleeping in a tree directly over the road! The tamandua was an older individual, with a chocolate brown coat where a younger individual’s coat would be creamy white. We took our time watching him snooze and were able to make some really wonderful closeup images. He awoke, briefly, seemingly in order to shift positions in the tree limb in a quest for comfort. As he did a toucan landed nearby and some of our group shifted over to photograph the iconic bird. We moved on to photograph a pootoo (a rare and bizarre bird that camouflages itself as a log). But the best moment of the drive was yet to come. 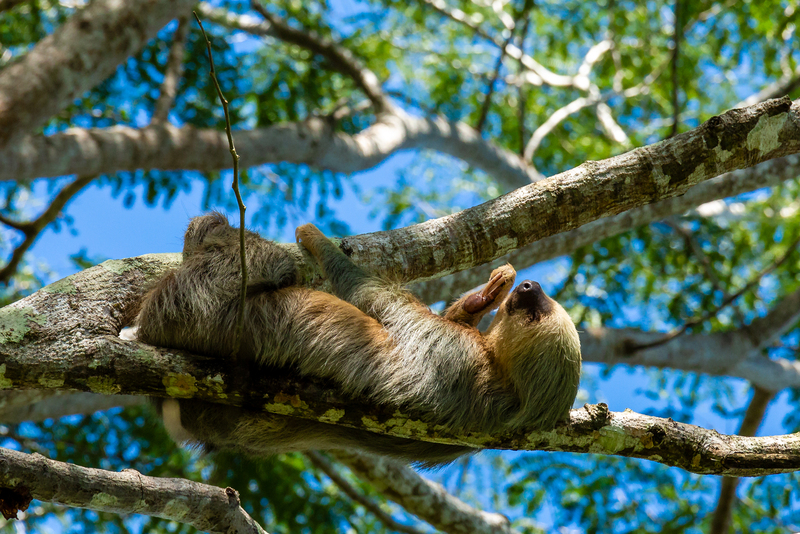 As the lunch hour approached we were on the lookout for one of Costa Rica’s most iconic creatures; the sloth. We arrived at a tall tree where earlier in the day Daniel had spotted a sloth. We quickly loaded out of the vehicle and heads craned up searching each branch. I have encountered sloths in the wild prior, however these sightings rarely have presented a good photographic opportunity. Usually they appear as little more than a ball of fur in the highest branches of a tree. 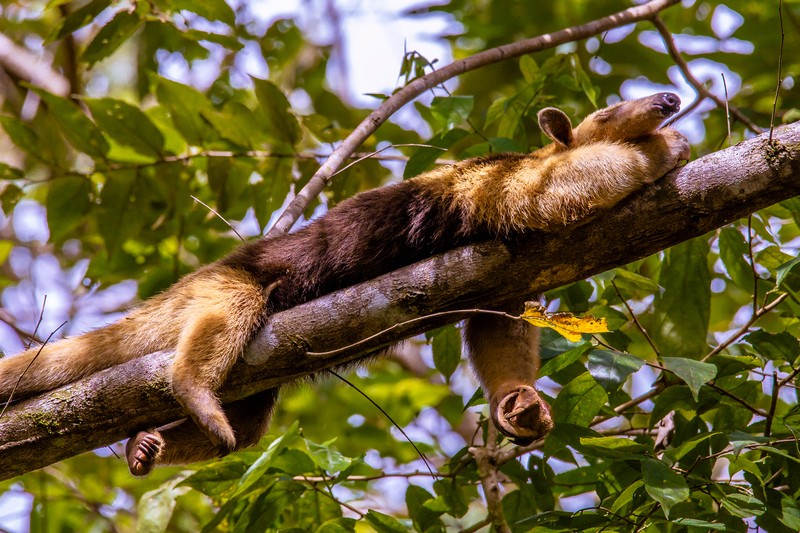 So, it was with amazement and surprise that we saw there, sleeping on its back on a lower branch, a two-toed sloth! It was bathed in perfect diffused light, and its adorable little face was angled straight towards us. I’d never encountered a sloth in such a photogenic position. And so, we spent the better part of half an hour exploring each possible shooting angle to capture this incredible sight. Once we felt satisfied that we had captured every possible image of this sleeping beauty, we packed up and headed to lunch at a jungle lodge and restaurant called Encanta La Vida. We shared our table with a class of surfing students and enjoyed a buffet of traditional Costa Rican dishes. After lunch, we packed up and headed back to Lookout Inn. 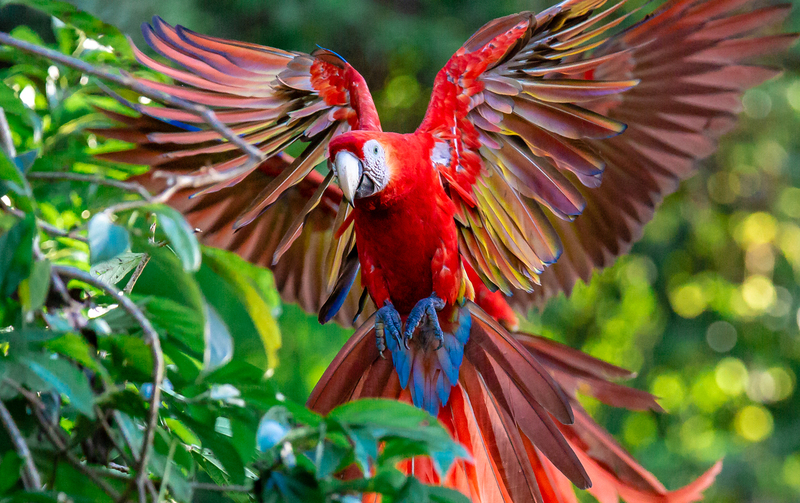 We would spend the remainder of the afternoon sipping cool drinks and photographing the macaws that flew around the lodge. We experimented with freezing the flying action of the birds with fast shutter speeds as well as shooting slower speeds to render motion blur. The sun set, and we moved upstairs for another gourmet dinner and a restful evening before beginning our last day on the Osa. We spent the entirety of our final morning at Lookout shooting -as per usual- toucans, macaws and the monkeys, enjoying our last wonderful gourmet breakfast. This morning was especially leisurely, allowing for packing up, and grab our last chance to capture those macaws! We ate lunch at noon, and by 12:30 Daniel had arrived to drive us back into Puerto Jimenez. The drive would also be leisurely as we slowly made our way along the jungle road in search of any last wildlife photography opportunities. We would encounter toucans, giant green iguanas and more macaws, gifting us with a few final images before the trip’s conclusion. We arrived back in Puerto Jimenez by 3 pm, heading back to the small airport to board our plane back to the city. Before departing, we paused for a few final hugs and a group photo with Daniel. As we took off, the sun setting, we were provided with one last beautiful view of Puerto Jimenez and Golfo Dulce. It is moments like this that make Costa Rica such a magical experience. Sure, it is the constant proximity to wildlife and pristine wilderness that make it such a dream destination for photographers, however it is also the culture, the setting, and the magic of the land that keeps us coming back again and again. This trip provided some of the best images I’ve yet taken in Costa Rica, and as always, I am very much looking forward to returning, again and again!